In Tokyo on Thursday, SoftBank CEO Masayoshi Son, who also owns roughly 80% of Sprint and has been feverishly working on possibly buying T-Mobile, announced a new device to the line up. Pair that with the upcoming auctions for 600MHz spectrum in the US next year, the pending IPO of Alibaba, of which SoftBank owns about 40%, and it goes without saying that Son has a lot on his plate. With all the money SoftBank is looking to spend, it is inevitable that the company would be eager to look at technological replacements to save costs, which happens quite often as a result of a major merger. That is not really what is happening here, but when you look at how this new robot is being rolled out by SoftBank in Japan. Meet Pepper. Pepper is a development of French company Aldebaran and SoftBank has invested heavily in this technology as well. Pepper is manufactured by Foxconn. What makes Pepper different from other robots is that this device is the “world’s first personal robot with emotions.” It gains that distinction by using a cloud-based AI system shared by other Pepper robots and thus, they learn from each other. Pepper is a short thing with a tablet mounted to its chest. 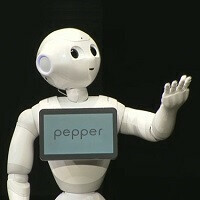 Not only will SoftBank begin using the robots in a couple of its retail locations in Tokyo to serve customers, but Pepper will also be for sale to the general public for roughly ¥200,000 (approximately $2,000) early next year. Now, if SoftBank is successful in buying T-Mobile and then buys big blocks of spectrum next year, you can be sure to expect some “efficiencies” (cost saving measures) to be discussed, and what better to replace that expensive employee than with a robot? Honestly, we do not see that happening in the near term in the US, and probably not even en masse on a retail level in Japan, however with Japan’s aging population, this technology is seen as a way to help nurses that will see their services increasingly in demand. Pepper obviously has a comprehensive voice recognition engine and the “emotion engine” is trained to understand facial expressions, body gestures, and tones of voice. Seeing the first interactive, practical retail rollout of robots does indeed mark the beginning of a new era, on par with the first personal computers and first mobile phones. That's awesome. But also kinda creepy, especially knowing that they "learn from each other"
They should replace Son with a robot. I bet the robot could do a much better job. First stage of robots taking over. I think this is the start of 'I, Robot'. Can it breakdance though... "Pepper is manufactured by Foxconn." Lulz! Japan has been preparing to use robots for a long time now. Their population is aging and they don't have enough able people to do everything people do. So they have been working on robots taking over the functions of some people. Can't wait until stuff like this comes to the U.S. 99% unemployment is the future, it will be pretty nice never "having" to work.